Who gets the worst deal from ObamaCare? It's no contest: A few million modest-wage workers — and their spouses — can't qualify for exchange subsidies but many will owe a $695 penalty. They're full-time workers for companies that offer health insurance that meets ObamaCare's dubious "affordability test." Consider single workers earning $17,500, or 150% of the poverty level. 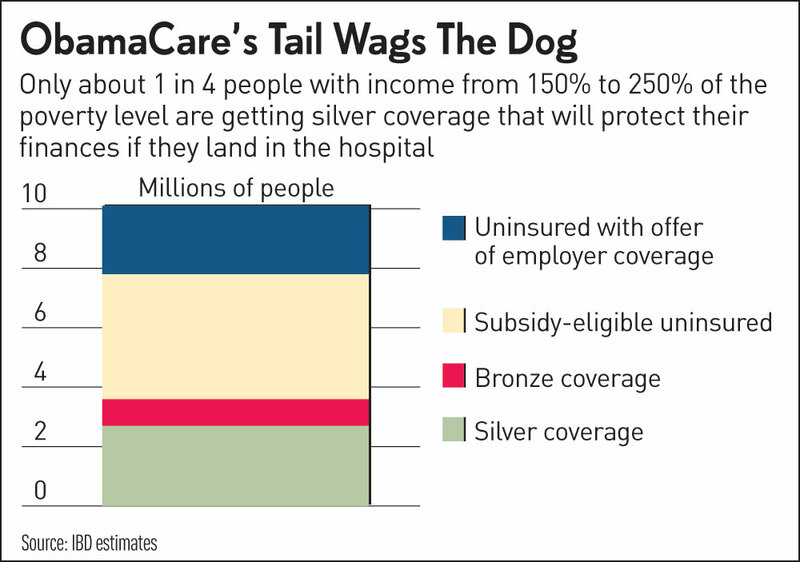 For such workers, bronze-type coverage with a $5,000-plus deductible is deemed affordable in 2015 even if it costs $1,670 — just under 10% of income. That's 15 times the $9 a month or less it costs workers at the same income level to buy subsidized bronze-level policies via HealthCare.gov. First, for many modest-wage workers, ObamaCare makes income inequality worse. The $695 penalty for failing to buy coverage will amount to a pay cut of 4%, or 33 cents an hour, for these $8.42-an-hour workers. Second, many employers have figured out they can keep a lid on health insurance costs and still dodge ObamaCare's employer mandate penalty by offering "affordable" coverage that modest-wage workers find unaffordable. That's a big reason why the employer mandate, though it's had a clear negative effect on low-wage work hours, hasn't been nearly as big of a problem as some feared. But trading one negative consequence for another should provide little solace to supporters of the law, which was after all intended to ensure affordable care. Andy Puzder, CEO of Carl's Jr. and Hardee's parent CKE Restaurants, says that just 420 of 5,453 full-time workers offered a $5,500-deductible plan were willing to pay the $1,116 premium. The New York Times reports that insurance take-up by fewer than 10% of low-wage workers is commonplace. Wendy's (NASDAQ:) initially expected its health insurance tab to jump by $25,000 per restaurant, but cut that to $5,000 after finding few interested employees. Oddly, ObamaCare has two sometimes contradictory definitions of "affordable." One, for employer plans, says coverage is affordable in 2016 if it costs no more than 9.66% of income, which means employees can't access exchange subsidies. The other says individuals should be granted a waiver from the individual mandate if the cheapest coverage available to them costs more than 8.13% of income. But that still means a $17,500 earner offered a $1,400 employer plan would have to buy it or face a penalty.